LVP Renewables supply reliable commercial Photo voltaic systems using energy sector knowledge to deliver energy savings and generate free electricity for your business. The solar PV systems can range from 11kw to 300kw with paybacks between 4 and 9 years depending on complexity and system components. We can offer roof and ground based systems depending on your requirement. All systems are nonpenetrative and can be engineered to be installed on membrane, bitumen or metal roofs. All systems are professionally calculated to take into account roof capacity, wind loadings, maintenance and safety. Our systems are turnkey but bespoke whilst using standard modules of equipment from trusted global suppliers. We passionately believe that the most underutilised asset in Ireland is Commercial roof space and that this should be leveraged to safeguard your company against rising energy bills in the future by producing free electricity. Improved bottom line by providing more power. This is achieved by giving maximum power generation from each module as weaker modules do not affect the strong ones. More energy by design. 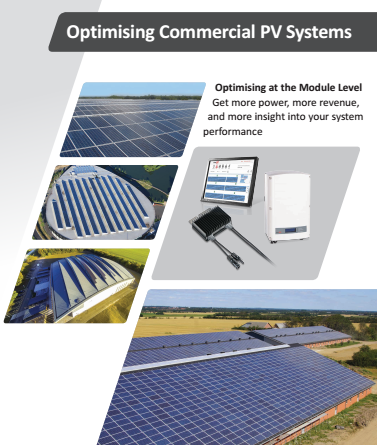 Increase your system capacity with more modules on the roof = more power. Cost saving maintenance. This is achieved by giving free module level monitoring for system life and complete system status for each module on your device. Future compatibility and warranty. This is achieved by low cost inverter replacement if out of warranty. Solar edge monitoring platform. This give full visibility of system performance and remote troubleshooting. We can apply to secure grant funding for Solar PV projects through the SEAI BEC (Better Energy Communities) Program. Sustainable Energy Authority of Ireland (SEAI) is offering assistance for energy efficient community projects through capital funding, available to business in Ireland by investing in Solar PV technology. We will prepare and submit your application and manage the whole process from start to finish. On systems larger than 11kw 3 phase a G10 relay is required and we will need to liase with the ESB to arrange. The BEC scheme does not apply to new builds just existing commercial space.